Wilson County is located in eastern North Carolina, as of 2010 the population was 81,234. The county seat is Wilson. The city of Wilson was established in 1849, named for Louis Dicken Wilson, a former state legislator and soldier who fought in the Mexican War. Colonel Wilson died of fever at Veracruz in 1847. After city residents complained that they were too far from the nearest courthouse, Wilson County was formed from Edgecombe, Nash, Johnston, and Wayne counties. While cotton used to be Wilson County’s primary agriculture product, it was supplanted by flue-cured tobacco in the 1870s. The city of Wilson thereafter would promote itself as being the best tobacco market in the world. James B. Hunt, Jr., governor of North Carolina from 1977 to 1985 and again from 1993 to 2001, was from Wilson County. 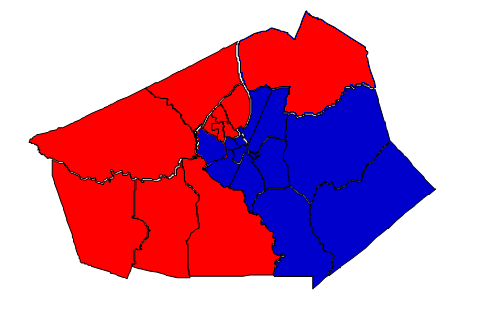 A map of Wilson County in federal races reveals the western side being strongly “red” while the eastern half being strongly “blue”. While this appears to be a geographic divide, it is actually racial. Wilson County is more homogenous in the west and similar demographically and politically to Johnston County. Eastern Wilson is more heavily minority and tends to offer more support for Democrats. The city of Wilson itself is similarly racially divided. Forecast: Wilson County was reliably Republican in presidential contests until 2008, when Barack Obama carried the county with a margin nearing that of his national landslide that year. Since then, Wilson has only continued to trend Democrat. Elaine Marshall even carried the county in 2010, which should be alarming to Republicans (Burr also lost here in 2004). Wilson is trending Democrat because the white vote is shrinking precipitously. As of 2010, the population of Wilson County is only 52% white. This is not a statistic that lends itself to Republican victories. At the same time, the turnout machine of Barack Obama registered hundreds of unregistered African Americans. The 2010 election results show that many of these voters are in the electorate to stay. In federal races, Wilson County has gone from being strongly Republican to strongly Democratic in the span of ten years. Even though whites in Wilson County gave 80% of the vote to Mitt Romney in 2012, they only comprised 55% of the electorate that year. The shrinking white composition of the electorate should be alarming for Republicans both in North Carolina and nationwide. Given that Walter Dalton carried the county by 5 points over Pat McCrory in 2012, it’s looking very likely that Republicans’ days of winning Wilson County are over. A lot of commentators here in North Carolina talk about the increased influence and changing demographics of places like Wake, Mecklenburg, and Buncombe. But eastern North Carolina is changing too and that’s having an effect on the state’s political leanings.